After the demise of Freedman’s Savings and Trust Company, it would take 14 years for African Americans to rally behind another bank. The first bank organized and operated by African Americans was Capital Savings Bank in Washington, D.C. Just four years after it opened, its deposits had grown to over $300,000. Capital Savings Bank provided the capital essential to the growth of black businesses, capital that white-owned banks were unwilling to lend. The community proudly deposited its money in Capital Savings Bank. The public’s confidence in Capital was rock solid in the early days, enabling the bank to exert a strong, positive economic impact on the community it served. During the Panic of 1893, the bank rode out the tide and was able to honor every obligation on demand. 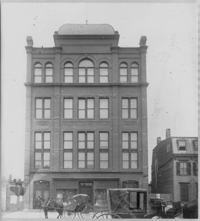 Capital Savings Bank helped many African-American businesses and property owners until it closed in 1902. Early on, African Americans realized the necessity of accumulating wealth and the subsequent benefits of collective financial security. The Free African Society, the Free Labor Bank, and the Freedman’s Savings and Trust Company laid the groundwork for black capitalism in America. Capital Savings Bank gave African Americans a venue in which to learn about and participate in the business of banking. It was set up to reach all classes of the community so that everyone could learn the valuable economic lessons of being industrious, seeking employment, saving their money, and getting homes. African-American churches and fraternal organizations built further on that foundation by serving as pooling places for the capital needed to open a bank that was sensitive to the needs of the African-American community. Between 1888 and 1934, 134 black banks were established, while from 1867 through 1917, the number of black businesses increased from 4,000 to 50,000. This entry was posted in Histronomics and tagged african american banks, black banks. Bookmark the permalink.